One of the most iconic & majestic trees in the UK. A lovely and intriguing stately evergreen, with whorls of sharp leaves. They can reach an elegant 10M in 20-30 years or so, but can also be trimmed to lower than this. A garden design classic - they make a great gift too. Supplied as a seed-raised tree 3 years old, 15-20cm tall in a 1L pot. 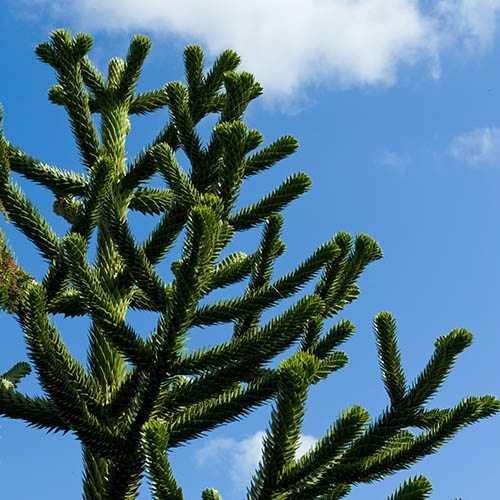 Monkey Puzzle is one of the most iconic. yet majestic and easily recognised trees in the UK, yet not widely planted nopw. Many of the tallest of specmens are a hundred years or so old, yet without the foresight of previous gardeners, we would have few to wonder at today. A lovely and intriguing stately evergreen, with whorls of sharp leaves, they are very slow growing in their first few years, and take a while to get going. They are thus a very expensive plant to propagate and sell. Despite this slow speed, they are relatively easy of planted and left alone! They can reach and elegant 10M in 20-30 years or so, but can also be trimmed to lower than this. Select a spot where it can be seen from, as they are best grown as a lawn or boundary specimen tree, with plenty of space around them. A garden design classic - try one now, they make a great gift too. Best grown in full sun in well-drained but moist soil. Fertilise anually with a slow-relese fertiliser and mulch with organic matter in the autumn. Select an appropriate spot with enough space to allow your tree to grow. Position in a sheltered area, protected from cold, drying winds. Holding the tree upright in position with one hand, slowly backfill the hole with soil, so the soil falls back around the roots. Firm the soil around the plant with your heel to ensure good contact around the roots. Plants establish quicker when Mycorrhizal granules are added to the roots when planting. There is no real need to prune trees. If absolutely necessary, damaged or dead branches can be removed from young trees. Established trees will not regrow.